Award winning resort, this jewel among resorts overlooks the Pacific Ocean and its own magnificent beach, a setting ideal for relaxation, yet with easy access to Mazatlán's Golden Zone. Emerald Bay's graceful architecture, gorgeous surroundings and beautifully decorated ocean view suites provide every comfort and convenience. Relax on the beach or by one of the pools, each with its own swim-up bar. Have a massage in the brand new European style Spa and Gourmet Restaurant, work out in the gym, play tennis on-site, or take advantage of the many nearby water sports. 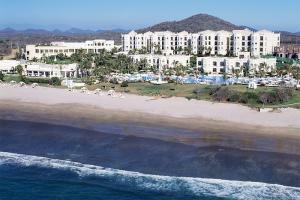 Located north of Pueblo Bonito Mazatlan, just 12 miles from Mazatlan's Golden Zone. La Cordeliere Restaurant, Kelly's Piano Bar, and In-Room Dining. El Faro, The Aquarium, El Quelite, Isla de la Piedra, Isla Venados, Copala, Concordia, Golf, Fishing, Sailing.